E.A.R. Inc. Do It Yourself Custom Ear Plug Kit is a terrific compromise solution when you want or need custom fitted ear plugs, but you are not ready to fork over more than $100 to get them! 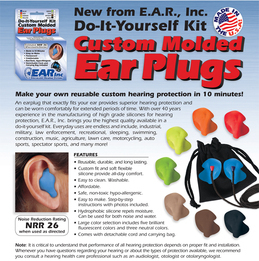 Now you can make your own custom molded earplugs, right in your home, at work, on the shooting range or in the office. The process takes about 10 minutes, requires no experience or special tools and when you are done, you will have an excellent pair of durable, perfectly fitting earplugs that, with the proper care, will last for many months of daily wear. Mold Them Yourself Convenience. Takes Just 10 Minutes! Not Made of Ordinary Impression Material - Permanent Ear Plug Material for Long Lasting Value. Removable Neck Cord and Storage Bag Included! E.A.R. Inc. Do It Yourself Custom Ear Plug Kit (Makes Two Ear Plugs. W/Carry Bag and Detachable Cord)2LarryJuly 11, 2018I have to admit that these earplugs just didn't work very well for me. I followed the instructions and allowed them to cure. They fit in my ears, but wouldn't stay in place when I put my motorcycle helmet on. The fit wasn't snug enough. A pity. I was looking forward to something more comfortable than the foam earplugs. E.A.R. Inc. Do It Yourself Custom Ear Plug Kit (Makes Two Ear Plugs. W/Carry Bag and Detachable Cord)4CraigAugust 18, 2015Easy to make work great and much cheaper than what you can buy elsewhere. E.A.R. Inc. Do It Yourself Custom Ear Plug Kit (Makes Two Ear Plugs. W/Carry Bag and Detachable Cord)5RossDecember 21, 2014What can I say, these DIY ear plugs are great. If you follow the instructions you can't go wrong. I will definitely be getting these again. E.A.R. Inc. Do It Yourself Custom Ear Plug Kit (Makes Two Ear Plugs. W/Carry Bag and Detachable Cord)5Tom B.September 17, 2014They worked really well. I am very happy with their performance. E.A.R. Inc. Do It Yourself Custom Ear Plug Kit (Makes Two Ear Plugs. W/Carry Bag and Detachable Cord)5Mike P.August 18, 2014Have tried every other ear plug I could find. Nothing worked good in my left ear. These work great. Comfortable, blocked noise well. Easy to mold, just don't take too long once the 2 parts are mixed. E.A.R. Inc. Do It Yourself Custom Ear Plug Kit (Makes Two Ear Plugs. W/Carry Bag and Detachable Cord)5Ted RadfordJuly 24, 2014Easy to make. Work very well. Great for motorcycling. Fit under helmet no problems. Quick and easy to insert. I recommend this product to all I meet. E.A.R. Inc. Do It Yourself Custom Ear Plug Kit (Makes Two Ear Plugs. W/Carry Bag and Detachable Cord)4ATJTNJune 9, 2014I think this is a pretty good product; but, i wan't happy with the fit on my second ear, pulled it out to redo, but by then it was a bit too late and i did not get a good fit by re-inserting it. My fault totally; once you get the putty mixed you must get it finished pretty quick! Really easy instructions, easy to do, i just stretched the time a bit too much. Will try out the good one next time i ride my Harley and if i get the results i think that i will, I'll likely order another kit. E.A.R. Inc. Do It Yourself Custom Ear Plug Kit (Makes Two Ear Plugs. W/Carry Bag and Detachable Cord)5SpitfireFebruary 4, 2014The plugs were easy to make and had a decent fit. My only suggestion would be to split the epoxy into the right portions per ear at the factory. I split the material into equal parts but didn't do it right - as one ear plug is larger and heavier than the other. E.A.R. Inc. Do It Yourself Custom Ear Plug Kit (Makes Two Ear Plugs. W/Carry Bag and Detachable Cord)5sendadstohellJanuary 22, 2014very disappointing. perfect mold but does not stay tight enough in ear to block much noise. waste of money. E.A.R. Inc. Do It Yourself Custom Ear Plug Kit (Makes Two Ear Plugs. W/Carry Bag and Detachable Cord)5TonyDecember 27, 2013I work offshore on a drilling rig and hate the foam ear plugs that they buy. They start to irritate my ears after a few minutes. I bought my DIY kit while I was at work my last hitch and made them as soon as I got home. They are very simple to make!!! I brought them to work with me a week ago and have been wearing them everyday for a week so far. They are very comfortable, easy to clean, and are great sound blockers. I recommend them to everyone, why spend $120 bucks for custom ones. E.A.R. Inc. Do It Yourself Custom Ear Plug Kit (Makes Two Ear Plugs. W/Carry Bag and Detachable Cord)5KeythNovember 24, 2013These by far are the best ear plugs for surfing. I've been surfing for 30+ years, traveled all over the world and swear these have help prevent "surfers ear". I recommend them for any water sport! E.A.R. Inc. Do It Yourself Custom Ear Plug Kit (Makes Two Ear Plugs. W/Carry Bag and Detachable Cord)1tturmanOctober 27, 2013Very disappointed overall. The earplugs are bulky and don't block sound that well. Save your money. E.A.R. Inc. Do It Yourself Custom Ear Plug Kit (Makes Two Ear Plugs. W/Carry Bag and Detachable Cord)5PatMay 30, 2013Less comfortable than foam earplugs. E.A.R. Inc. Do It Yourself Custom Ear Plug Kit (Makes Two Ear Plugs. W/Carry Bag and Detachable Cord)5Jerald w Pitre JrMay 17, 2013Ok first of all. The prices for these earplugs is just right. The easy to do instructions and it doesn't take long to make them. I work on drilling rigs and I have seen companies pay over $100.00 for a pair of these. I ordered me and my wife some enjoying them very much. Thanks for this product. Jerald w Pitre Jr Jennings, Louisiana. E.A.R. Inc. Do It Yourself Custom Ear Plug Kit (Makes Two Ear Plugs. W/Carry Bag and Detachable Cord)1NickApril 20, 2013I bought these for use while shooting. They were easy to make and looked good, BUT......they don't block much sound. Actually they are a total waste of money. E.A.R. Inc. Do It Yourself Custom Ear Plug Kit (Makes Two Ear Plugs. W/Carry Bag and Detachable Cord)5ChrisMarch 14, 2013I followed the directions but I kneaded the material too long and it was too hard to mold to my ear. Luckily out of the remainder I had plenty to make 2 plugs! They seem to muffle sound pretty good as I had to raise the volume on my helmet intercom quite a bit. E.A.R. Inc. Do It Yourself Custom Ear Plug Kit (Makes Two Ear Plugs. W/Carry Bag and Detachable Cord)4Bobby64September 11, 2012I use these puppies for sleep. They don't block sound out as well as typical foam ear plugs do, but they're much more comfortable: I never have to worry about waking up in the middle of the night with a hurting ear. The smooth texture took some getting used to. They were pretty easy to put together. I'm satisfied overall. E.A.R. Inc. Do It Yourself Custom Ear Plug Kit (Makes Two Ear Plugs. W/Carry Bag and Detachable Cord)2KaylieghSeptember 3, 2012The process was easy to do and fast and seem as if they would do the trick fitting the ear so well....These plugs didnt really do what I was thinking. They fell out in the water while my son was using them. So if you are looking for something to blosk water from getting in def would say works little to not at all for that as far as keeping noise out they do a pretty good job at that. E.A.R. Inc. Do It Yourself Custom Ear Plug Kit (Makes Two Ear Plugs. W/Carry Bag and Detachable Cord)3SoniaJuly 25, 2012I got this kit to make custom ear plugs for my 3 year old son who recently had tubes put in his ears. The process was easy to make, and they fit perfectly. The problem I have is that they are so hard that they do seem to pop out unexpectedly. Plus, after a shower, the ear still feels wet. I love the concept, but not the carry through. E.A.R. Inc. Do It Yourself Custom Ear Plug Kit (Makes Two Ear Plugs. W/Carry Bag and Detachable Cord)5Tim GJune 28, 2012I have had these previously. This ythe first time I made them myself. They work great. E.A.R. Inc. Do It Yourself Custom Ear Plug Kit (Makes Two Ear Plugs. W/Carry Bag and Detachable Cord)1GordonMay 23, 2012This seems like a great idea in theory - ear plugs molded to one's individual ears - and I was willing to pay an price way above any other kind of ear plug, hoping they would be much more effective than ordinary ones. The molding process worked fine and they came out perfect - but I find them *less* effective in blocking sound than ordinary foam or soft silicone plugs. I think the material is too firm when set, and therefore it seems impossible to fit them fully into the ear - and without being able to do that, they're not very effective at all. E.A.R. Inc. Do It Yourself Custom Ear Plug Kit (Makes Two Ear Plugs. W/Carry Bag and Detachable Cord)2Brian LankowMay 22, 2012I bought 2 pairs of the DIY ear plugs and they were mainly for motorcycle riding. I made the first pair and they sealed nice, that is, until I tried to put on my helmet. In no way could I put on my helmet without loosening the ear plugs. So, I made another set of ear plugs with only one-half the amount of molding, so as to make them much smaller. Still, the helmet would knock them loose by just installing it. So, these do not work for me at all. They were easy to make and seem like they'd last a while, but they can not keep a strong seal while installing a good-fitting helmet. E.A.R. Inc. Do It Yourself Custom Ear Plug Kit (Makes Two Ear Plugs. W/Carry Bag and Detachable Cord)4D.L.BenderMarch 24, 2012Used them to create custom earbuds for racing. This was a second attempt with this product. The first set did not adhere to the earbud units I had. So, I had to order a second set. The first were also the "natural" color and dried VERY grainy on the outside and resembled a pencil eraser. The second was "florescent" red and dried MUCH smoother. I also have a set of FUZE brand custom - DIY - earbuds that included the buds and two part silicone plug material which made an EXCELLENT pair of custom earbuds on the first try. They are SO good I won't use them for racing...THAT is why I decided to try the cheaper E.A.R. brand.I would, however, recommend the E.A.R. brand for an economic alternative. And if you want JUST earplugs..without speakers..this IS your answer. I am ordering another (3rd) set to have on hand. E.A.R. Inc. Do It Yourself Custom Ear Plug Kit (Makes Two Ear Plugs. W/Carry Bag and Detachable Cord)5Tim TMarch 14, 2012I used this product to mold custom fit ear phones around my existing earbuds. Easy to use, and now it blocks out all external sound and increases bass response. They are very durable too.